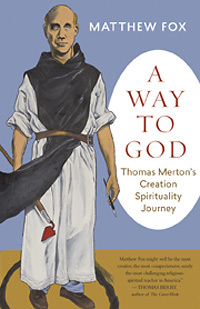 In 2015, groundbreaking theologian and bestselling author Matthew Fox was invited by the Thomas Merton Center in Louisville, Kentucky, to give a lecture to honor the centennial year of the legendary Catholic monk and writer’s birth. In preparing for the talk, Fox reimmersed himself in Merton’s work and revisited the correspondence they shared while Merton was alive. As Fox read through Merton’s journals, poetry, and religious writings, he realized that his exploration was generating far more inspiring material than just one talk. The result is A Way to God: Thomas Merton’s Creation Spirituality Journey, a powerful book about Merton’s pioneering work in deep ecumenism and interfaith; about his essential teachings on mixing contemplation and action; and about how the vision of thirteenth-century mystic Meister Eckhart profoundly influenced both Merton and Creation Spirituality, which Fox has long espoused and written about. We hope you’ll enjoy this short excerpt from the book, which introduces the four unique paths at the heart of Creation Spirituality. How do we grow, deepen, and surrender to love and grace and action? That is where the Four Paths come in and assist us in naming our deepest journey. • Via Positiva: This is the path of wonder and awe. Or as Merton begins: “Our real journey in life is interior; it is a matter of growth, deepening.” Awe is an inner response, an opening to the beauty and wonder of life and God. In this moment, Merton was on the cusp of moving away from the Augustinian and Neoplatonic “upwardness” of his early years. That same year, 1958, Pope Pius XII died and Pope John XXIII was elected, and within a few years, Pope John would call for a Second Vatican Council to redirect the church. With the help of Meister Eckhart and D. T. Suzuki, Merton learned to redefine spirituality in a way that was more ecumenical and more prophetic, more grounded and earthy. He no longer “escaped upward” away from matter, but he reimmersed himself in incarnation and transformation. He moved from a “Climbing Jacob’s ladder” mentality so basic to patriarchy to a “Dancing Sara’s Circle” mentality that was far more democratic and grounded and bodily and feminist. As a monk, Merton moved from contemplation alone to the vocation of the mystic as prophet, or the contemplative in action. Clearly, it was a Creation Spirituality journey. Matthew Fox is the author of over 30 books, including Meister Eckhart, and A Way to God. A preeminent scholar and popularizer of Western mysticism, he became an Episcopal priest after being expelled from the Dominican Order by Cardinal Ratzinger, who later became Pope Benedict XVI. You can visit him online at www.matthewfox.org. Excerpted from A Way to God. Copyright © 2016 by Matthew Fox.